Interest payments on the national debt are projected to be the fastest growing part of the federal budget over the next decade, according to a Dec. 14 report by the Committee for a Responsible Federal Budget. 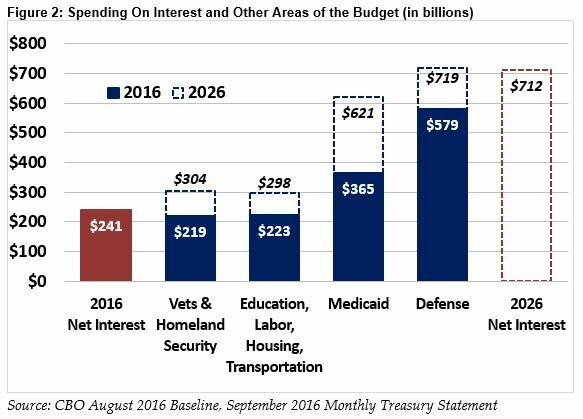 The $241 billion paid on interest last year surpassed the combined spending of the Departments of Transportation, Education, Labor, and Housing and Urban Development. Last year’s interest payment is more than four times the $55 billion FY2017 investment level for highways and public transit in the FAST Act. Transportation spending is now frozen at FY2016 levels through April 28, 2017, under the continuing resolution passed last week by Congress and signed by President Obama. The Federal Reserve raised its benchmark interest rate Dec. 14 for the first time in a year and signaled that rates could continue to rise in 2017 more quickly than previously expected. The debt impact of President-elect Donald Trump’s call for increased infrastructure investment is already being raised on Capitol Hill, with Senate Majority Leader Mitch McConnell (R-Ky.) Dec. 12 noting the need to ensure any such package include responsible provisions to ensure the spending does not add to the deficit.